Featuring Thomas, Annie and Clarabel, this simple layout is quick to set up and allows for easy expansion. 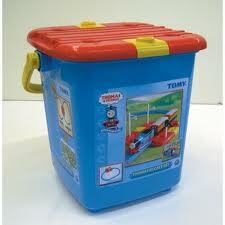 A large capacity storage bucket with a lid that cleverly links to the track from the crossing. Complete with tree, signal and overhead lines. Set layout dimension 70 x 60cm approx. Requires 1x AA battery.